Baby's first yeat calendar is a convenient way to record important events and milestones of baby's first 12 months. Coordinating die cut stickers, titled with important events from baby's first year, provide an easy way to remember baby's milestones. This calendar includes archival quality pages, all pages are acid-free and lignin-free. The open calendar measures 11" wide x 18" high, perfect for wall hanging or writing at your desk. 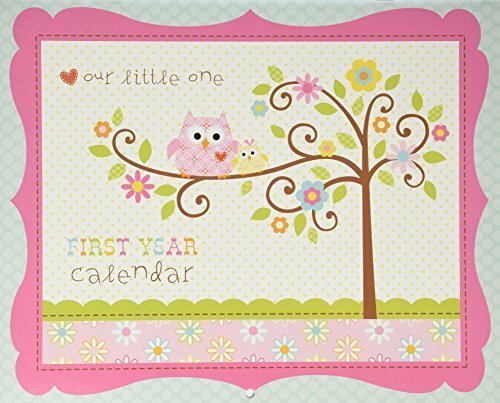 This Happi Baby Girl calendar was designed by artist, Dena Fisbein, and is brought to you in partnership with C.R. Gibson. The name C.R. Gibson has been synonymous with quality for more than 140 years. Starting with the creation of the very first baby book in 1898, along with timeless baby keepsakes, families around the world have depended on C.R. Gibson as their number one provider of products that celebrate life's most cherished moments. Understanding the importance of preservation and craftsmanship, C.R. Gibson products offer a tradition of excellence and quality. C.R. Gibson sets a standard for style that reflects today's top fashions while creating a timeless treasured keepsake.